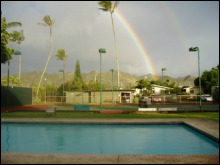 ​Welcome to what has been described as "the best tennis club this side of the Mississippi", the Kailua Racquet Club. A member owned, private tennis club, we are nestled in the heart of coconut grove in the wonderful beach community of Kailua. 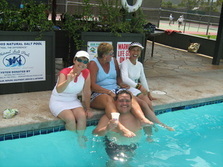 Since 1938, KRC members have enjoyed the club's relaxed ambience and many amenities. Wonder what the weather is at the club right now? ​Enjoy a live video of courts at the club by clicking below.